My earliest memories of prefabs, were of those on a beautiful site on Broom Hill, Strood, Kent, overlooking both the Medway and the Thames rivers. I remember my parents warning me not to play with the children from the prefabs. Later I remember that my father got to know some of the men, who worked at the same factory. When the prefabs were removed to make way for a park, he told me that the residents loved their life there and did not want to move. They were a community. A familiar story for prefab estates. In the 1960s [Walter Segal] and his new partner Moran Scott decided to demolish and rebuild their home at Highgate. They built a temporary structure in the garden using standard cladding materials and with no foundations other than paving slabs. It took two weeks to build and cost £800 [about £11,000 in present values – a third of the average family income]. This house roused considerable interest and led to a number of commissions using a similar style around the country. As the system developed the clients were able to do more and more of the building themselves. This three-bedroom detached property can be found on a peaceful cul-de-sac in Honor Oak. It is an architect-designed, timber-framed house that was built in the early 1980s, using the ‘Segal Method’, a system of design and construction pioneered by the celebrated Swiss architect Walter Segal. The sales pitch makes it sound a desirable property. Although larger and not a prefab, it is reminiscent of the best of the design styles of the post war prefabs. It isn’t a prefab but it looks a bit like one. £320,000 says there’s not much prefab prejudice here. I can’t imagine parents forbidding their children from playing with any children that lived there. Searching Google Scholar for work on the UK post-war prefab programme, it’s relatively easy to find papers which criticise the programme for failings in its organisation and its cost overruns but almost impossible to find any investigation of what the residents thought about living in them, anecdotal press reports seems to be all we have. Absolutely prefabulous: Residents of Britain’s last prefab estate battle to save homes that were built to last only ten years. There is however, the excellent “Social Pressures in Informal Groups: A Study of Human Factors in Housing (1950)” by Festinger et al. It’s not a study of prefabs per se but the site he studied was similar to the prefabs in the UK. I have yet to meet a planner or architect that has read it. In October The Prefab Museum visited Strood, Kent and I met some of the people that had lived in the Broom Hill prefabs. It was a familiar story: residents loved their prefabs, the community spirit & etc. The original Prefab Museum was torched (Catford Prefab Museum fire ‘devastates’ curator) and is now peripatetic. It is run by Elisabeth Blanchet and Jane Hearn. I met one man who had lived in a prefab as a boy. When the roof fell in in a storm his family was rehoused in a new council house. Because it was the 3,000th (I think that was the number) there was a small ceremony involving the mayor. Being polite he lied to the mayor and said how much better the new house was, while wishing he was back in the prefab. There is a lesson there somewhere. 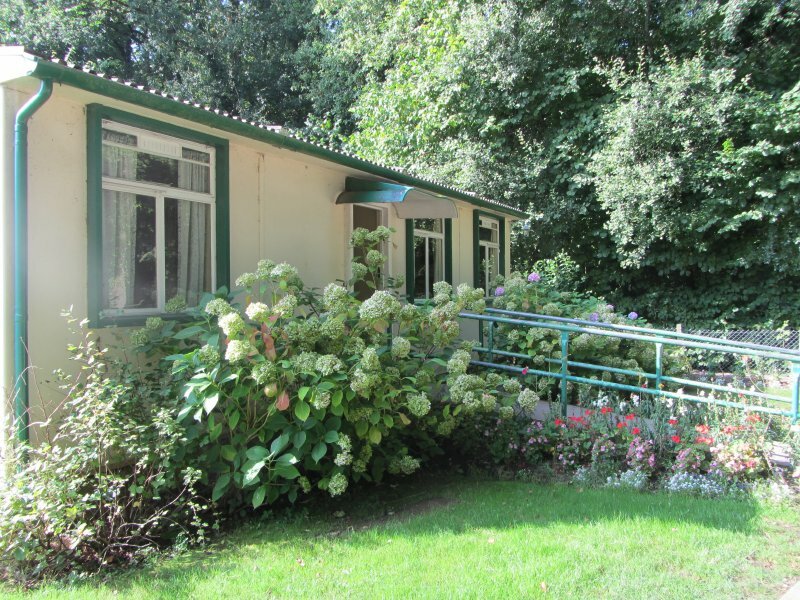 Jim Blackender was in charge of the Tenants’ Group to save the Excalibur prefabs from demolition by Lewisham Council. He lost the campaign and, disappointed, he moved out of his prefab in Autumn 2012. Thoreau’s masterpiece [Walden] shows how owning one’s own home, and in his case building it, or at least having a secure home, can banish worries, especially those of the landlord’s footstep on the stair as he comes with your eviction notice. Prefabs took that worry away.